What could possibly be more fun than drinking wine with friends and family? Stomping grapes and drinking wine! In ancient Rome, grape stomping was commonly practiced because of the belief that the initial juice extracted from the grapes had special properties. Thus, using your feet and “treading” the grapes was the gentlest way to squeeze out the juice without ruining it. Once that was done, wine presses were used for the bulk of the juice. The Egyptians too, would initially stomp on the grapes and then place the remnants in a large sack that had poles connected to the corners. They would take the poles and twist them, squeezing the rest of the juice out. In most of rural Europe, the practice of grape stomping has been absent since the Middle Ages. In the United States, grape stomping was banned at the end of the twentieth century for health and sanitation reasons. If grape stomping is no longer used to make wine, then why do we see grape stomping festivals around harvest time, why do we do it? The answer is simple, it’s a celebration! We participate in grape stomps to celebrate harvest and wine as well as to acknowledge the history of winemaking. Picture vineyard covered hillsides, ripe bunches of grapes hanging from the vines, breathtaking golden sunsets, now add in some grape stomping and we are immediately transported to the beauty and romance that is the culture of wine and winemaking. Grape stomping is a chance for us to step outside our daily routines, to be transported to a different place and most of all to have fun! 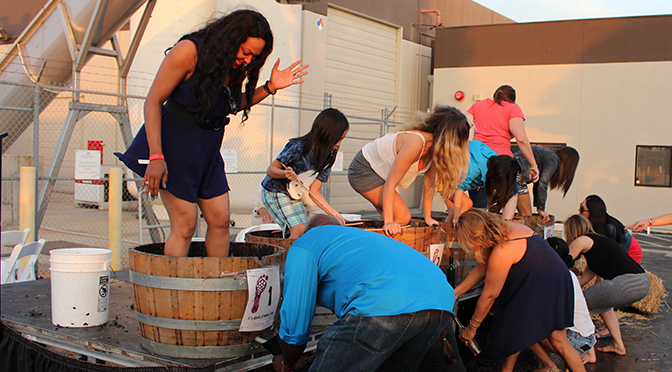 Here at Callaway Winery, we honor the festive history of grape stomping at our annual grape stomp. This year The Great Grape Stomp will be held on Saturday, August 6th, from 6pm to 9pm. This is one of the most fun events of the year. We will have dancing, dining, grape stomping and wine for the adults. This is a family event so the children are invited to do some grape stomping too. Music for the evening will be performed by Gino and the Lone Gunmen. They play a rockin’ mix of rockabilly, swing, blues, country and vintage rock and roll, promised to get you moving on the dance floor! Games and face painting will also be available. You may get a little messy, you may get a lot of messy, but it will be worth it! Tickets can be purchased online by CLICKING HERE, or by calling 951.676.4001. 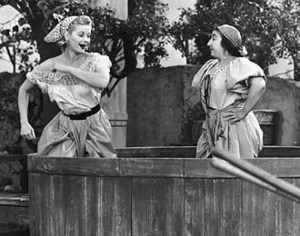 Channel your inner “Lucy”, get your feet ready and join us at the grape stomp!